(Bloomberg) -- Legislation aimed at restricting share buybacks would likely contribute to a record string of leveraged buyouts if enacted, Canaccord Genuity says. "An LBO boom coupled with a restriction on buybacks would likely mean even fewer surviving companies, higher stock prices at the end of this cycle, and an even worse financial disaster following the peak due to the added leverage," writes analyst Brian Reynolds in a note. Reynolds’ conclusion stems from what he says is the problem of the modern financing system: public pensions. Pensions have become the dominant global investor while "grossly underfunded," forcing them to reach for risk. That desire for yield, coupled with Treasury and Government Agency yield curves inverting at some point in the next 1-3 years, could result in even more LBOs than currently expected. 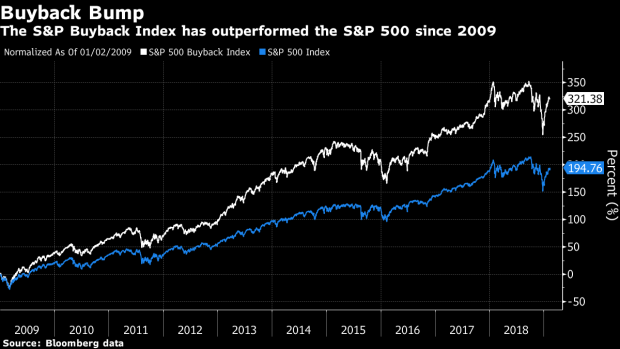 "While it is easy to say that buybacks are ’bad,’ we contend they are just the symptom of the pensions’ need for returns," writes Reynolds. "The demand for risk by the pensions remains unabated, and that demand morphs into some form of shadow banking designed to produce the results that the pensions require." The Canaccord note comes as the debate surrounding share buybacks has emerged again following a New York Times op-ed by Senate Majority Leader Chuck Schumer and Senator Bernie Sanders on Feb. 4 that called out the practice. Schumer and Sanders plan to introduce legislation that would prohibit companies from buying back their own shares without reinvesting in workers through a $15 minimum wage, seven days of paid sick leave and "decent pensions and more reliable health benefits." Earlier Tuesday, CNBC reported that Senator Marco Rubio is planning to push for higher taxes on capital gains to discourage companies from pursuing stock buybacks. Such proposals are misguided, according to Reynolds, whose report was released before news of Rubio’s plan broke. Reynolds says the Schumer-Sanders measure has little chance of being enacted for at least a few years and, if it came, would result in the unintended consequences of still more "shadow banking." "Unless politicians and regulators can change the behavior of public pensions (which we think is unlikely until after the next financial crisis), we think another boom and bust lie ahead," Reynolds writes. --With assistance from Scott Schnipper.